they must have served in the armed forces and be under the age of 30 or must have one parent who is serving or has served in the armed forces. They must possess a good school record and potential for future development. Up to World War 2 these awards were often the sole means of enabling young men to embark on higher education; but on the introduction of mandatory grants for such education, the significance of this type of scholarship changed. Nowadays the awards, made to both men and women, are smaller in real terms (up to £300 per annum) and are graded to reflect the fund's view of the merit of the candidate as well as their need for financial support. In the late seventies the Council of the Fund found another important area of real need in the field of management training; more specifically in the training of mature young men and women graduates for important posts in British business at home and abroad. Awards in this field are permitted by the Fund's original Charter which authorised: "Travelling Scholarships … to enable persons who have completed their degree course … to study at home or abroad, with special reference to the promotion of trade and industry". In 1980 the Council awarded its first Kitchener European Scholarships of £1000 towards the cost of a one year course leading to a higher degree in Business Administration (MBA). The European Institute of Business Administration at Fontainebleau, known as INSEAD. was chosen so that students would be able to benefit from mixing with 'those from other business environments, particularly European'. The scheme was an immediate success and continues unchanged, except that the value of the awards has been increased to £2000 in line with rising costs, but even then this represents less than 10% of the total cost of the course. Candidates, both male and female, must have Service connections, as for the undergraduate scholarships, and require a strong recommendation from their employers or associates. They must have been accepted for an advanced business course and satisfy the Fund that they possess the necessary character and potential ability to benefit British business at home and abroad. The system of undergraduate financing has changed in the last few years and student loans have been introduced so that once more university candidates are faced with financial problems, which with the proposed increase in fees seems only likely to increase. Kitchener scholarships have, therefore, taken on a renewed significance, very familiar to the importance of the scholarships awarded in the early years of the Fund. Business school education has developed in importance since the Kitchener Fund decided to sponsor it and, along with the growing recognition of such a degree, the costs have also increased. As a result the Fund is not able to help as many deserving candidates as it would like. The Council monitors closely the success of all Kitchener scholars and in the case of INSEAD the Fund is pleased to announced that, from the 59 candidates who have completed their courses since the inception of the scheme, 24 (41%) qualified with distinction, a further 16 were placed in the top 25%, 10 finished in the top third and the rest were in the top half, thus fully justifying the Fund's selection procedures. Present resources permit the award of no more than one European Management Training Scholarship. The Council would like to increase this figure to at least two and, in addition, to increase the amount of each grant. The experience of the past 15 years indicates that there are plenty of well-qualified candidates. The Council would also like to increase the number and value of scholarships for school leavers. To make this possible the Council aims to raise a capital sum of £250,000. This would permit an increase in the number and value of scholarships for one-year courses leading to an MBA degree and a substantial increase in the number and value of undergraduate awards. 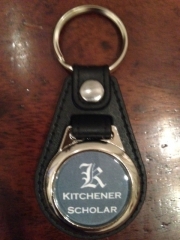 Substantial sums have already been donated by Kitchener Scholars, and other friends of the Fund have contributed generously. We are now extending our Appeal more widely.